I am guessing it was at 6 pm sharp, or maybe a few minutes earlier, when I called the Tea Party to order and thanked our signature chefs. 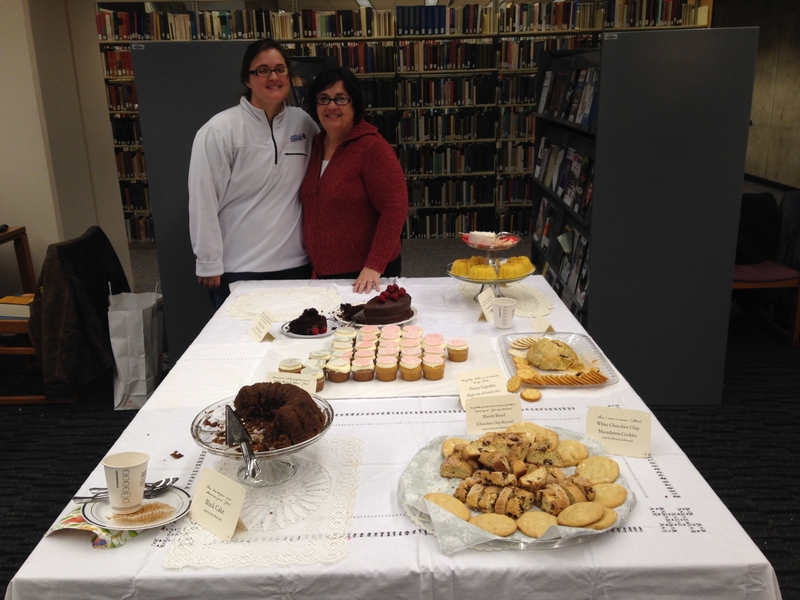 Mary and Lexie had laid out a wonderful spread for us. 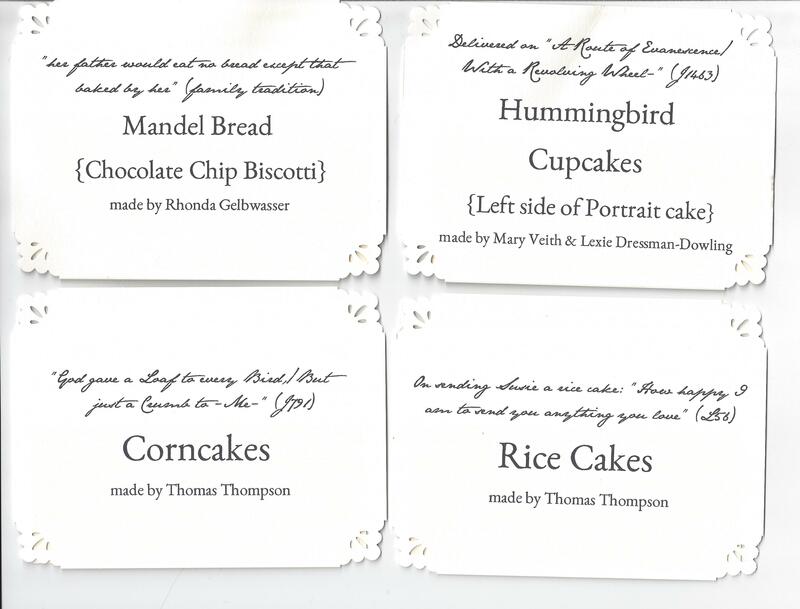 One table featured Kitty Beckerich’s version of Emily Dickinson’s Black Cake, Nicci Mechler’s version of her Coconut Cake, Thomas Thompson’s versions of her Corn Cakes and her Rice Cakes, Mary Vieth’s version of her Ox-Blood Cake and Mary’s original Portrait Cake, and two signature dishes by Rhonda Gelbwasser, Mandel Bread and White Chocolate Chip Macademia Cookies. 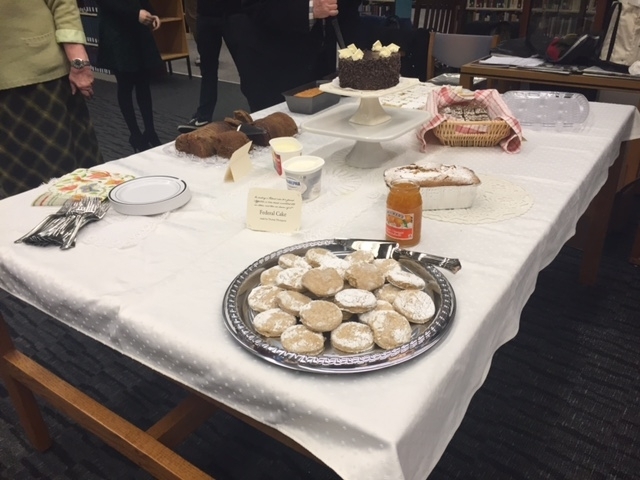 The other table of the Tea Party included Dickinson’s Federal Bread and Brown Bread by Thomas Thompson, her Ginger Bread by Kitty Beckerich and her Coconut Bread by John Campbell, and one store-bought concoction, the famous Opera Cream Cake that John had brought from Bonbonnerie in Cincinnati. Certainly one of the most unique creations was the Portrait Cake that Mary Vieth made in homage to Brain Morris’s I cannot see my soul but know ‘tis there. Mary liked the challenge of trying to replicate the way in which Brian had recreated the appearance of Dickinson’s youthful daguerreotype portrait by the way he spaced the words of her poetry that he wrote with colored pencils on paper. As the physical base of her Portrait Cake, Mary baked 48 Hummingbird and Honey cupcakes from Dickinson’s recipes. Her equivalent of Brian’s colored pencils was the icing in black and read she “wrote” over a layer of white. 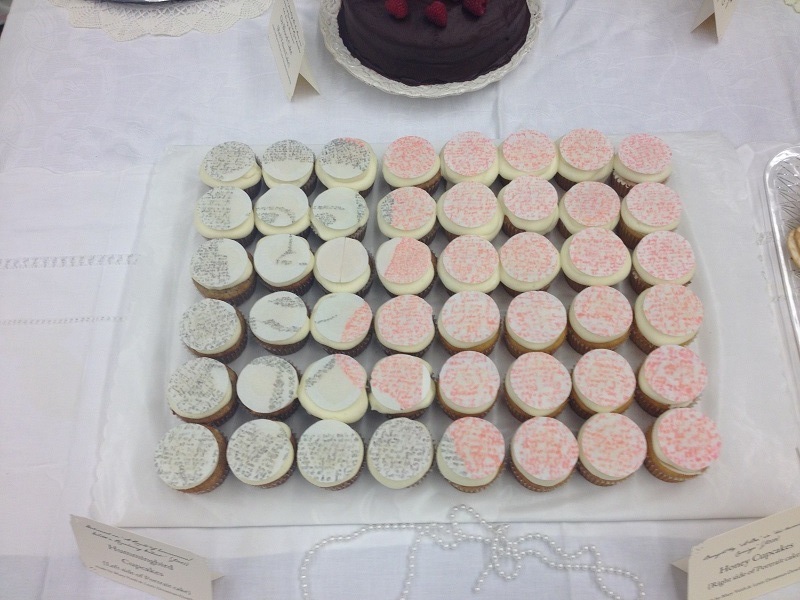 Look into the three rows of cupcakes on the left and you will see the distinctive features of young Emily’s daguerreotyped face slowly take shape. 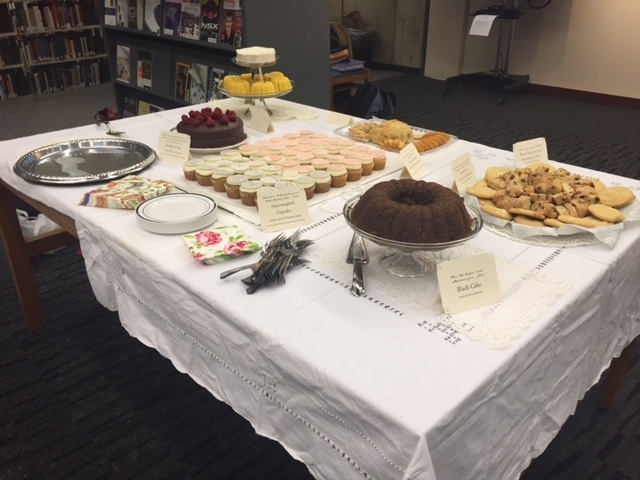 We did our best to consume these treats before the Tea Party ended at 7, but given the sumptuous extravagance with which our signature chefs had answered the call, there were plenty of goodies to be taken home for private enjoyment and more than one church coffee hour the next morning. Somewhere in the midst of the Tea Party, I thought to ask Mary and her assistant Lexie if they would pose for a photo together. Emily Dickinson began poem 791 with these words: “God gave a Loaf to every Bird— / But just a Crumb—to Me—.” Throughout her life she made loaves of bread and plates of cake for everyone she knew while keeping her poetic gifts mostly to herself, somehow confident that in the ultimate economy of the spiritual world, “It might be Famine—all around,” yet “I with but a Crumb / Am Sovereign of them all.” Dickinson the baker / poet ultimately did find a way to have her cake, and eat it too. Any of us who heard the artists lecture or the musicians perform on Thursday or Friday night, who participated in the Marathon Reading on Friday or Saturday, or who attended the Exhibition Walk on Friday or the Panel Discussion on Saturday, are the richer for it. 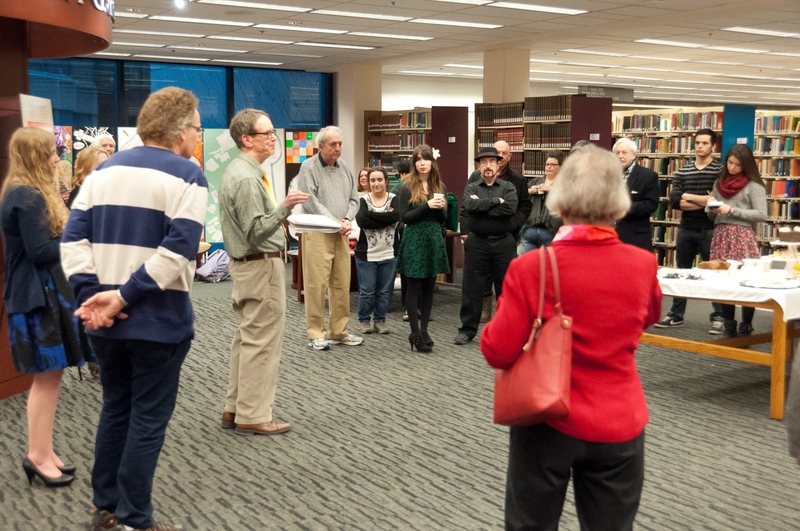 The same can be said for those who savored the student art exhibition or its catalog over the weekend, or who indulged in the Reception for Student Artists on Friday or the Tea Party on Saturday. One can only wonder what Dickinson herself would have made of this three-day Fest in celebration of her life and art. As we were packing up the remains of the Tea Party feast on Saturday evening, Emma Rose and I remembered that we had one more thing to do before leaving. Tonight was the end of the Dickinson Arts Fest, but our exhibition would be up through early May. In anticipation of that, we had ordered a large poster for the exhibition itself, designed by David Bushle in the NKU print shop. We had provided the text, but we left it to him to create the design and to chose the art from the exhibition that would enhance it the most. 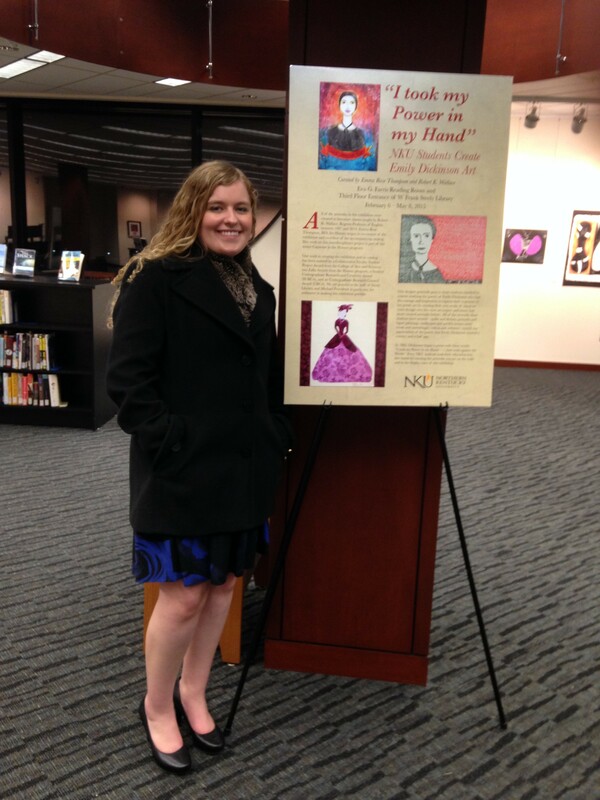 Since Emma Rose had designed the catalog and installed the exhibition, she had the honor of turning the next big page of our Spring Semester. This entry was posted in Part 3. Emily Dickinson Arts Fest, February 12-14, 2015 by wallacer2014. Bookmark the permalink.